To become like Christ, we must spend each day doing the following three things: Prayer; Sacrifice (Fasting); and Good Works (Almsgiving). Mondays beginning at 8:30 PM until 9:00 PM. Wednesdays beginning after the 8:30 AM Mass and ending Thursday before the 7:00 AM Mass. First Fridays beginning after the 9:15 AM School Mass until 5:00 PM closing prayer with Benediction. Part of any Lenten season means our traditional Friday Knight Fish Fry. All persons who have completed their fourteenth year are bound by the law of abstinence. Explanation: The law of abstinence means that a person is bound to abstain beginning the day after one’s fourteenth birthday. The law of fast means that adults are bound to fast from the day after their eighteenth birthday until the end of the day of the fifty-ninth birthday. Application: The law of abstinence forbids the eating of meat and foods prepared with meat or meat by-products. The law of fast allows only one full meal and two lighter meals in the course of a day, and prohibits eating between meals. 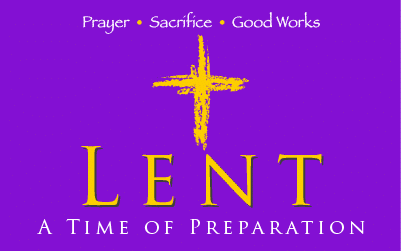 In the United States, Ash Wednesday and Good Friday are days of fast and abstinence. All other Fridays of Lent are days of abstinence only.